Eric Elms is a shareholder with the firm and practices primarily in the areas of personal injury and insurance litigation. 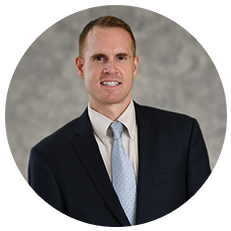 As a former claims manager for a Fortune 200 company, and now a civil trial attorney, Mr. Elms has handled insurance matters from start to finish. If insurance is involved, Mr. Elms can assist. Also, he is one of three Ninth Circuit Representatives on the Florida Bar Young Lawyers Division Board of Governors, has been listed as a Rising Star in the area of Civil Litigation Defense since 2015, and has been routinely recognized by the Florida Supreme Court for his pro bono work since 2014.